Summary: A fantastic walk which involves a spectacular scramble up the rock face of Pavey Ark via Jack's Rake. The Rake is classed as a grade 1 scramble and it does involve regular use of your arms to pull you up to some of the steeper parts of the ascent. There are also some places that are extremely exposed so a head for heights is certainly required. 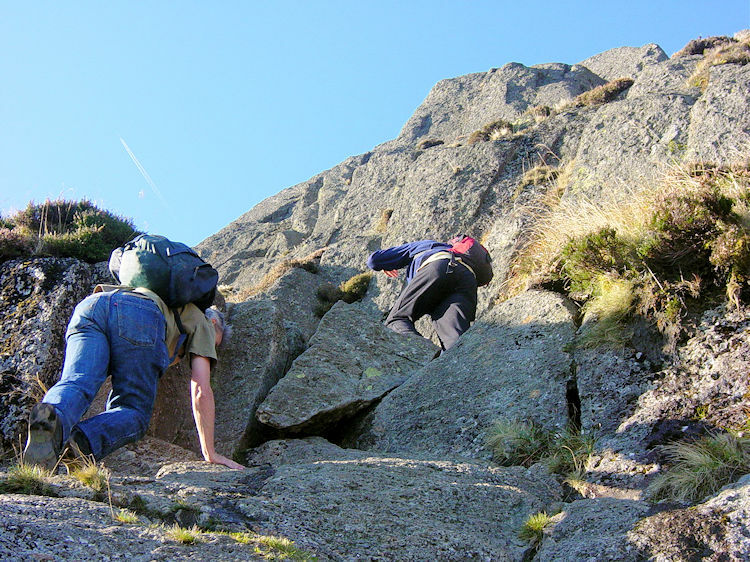 Having said that the scramble is not at all difficult for experienced fell walkers. 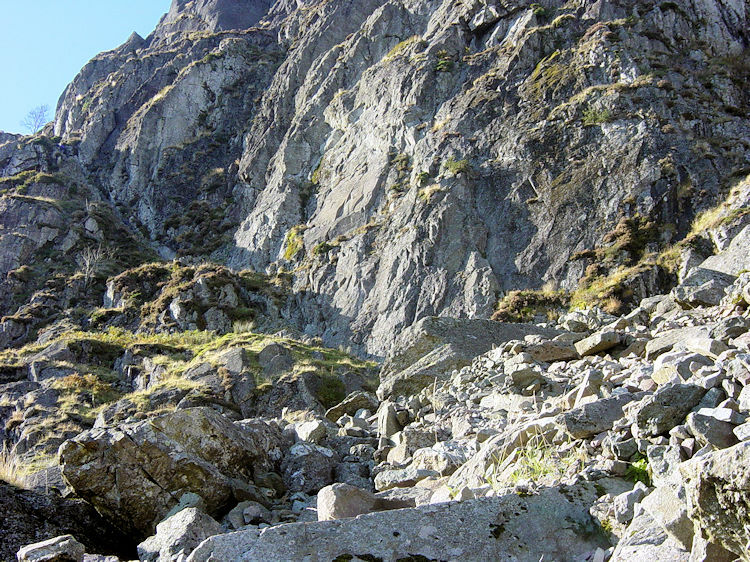 It is the initial nerves that need to be conquered as it was for me on my first climb of the rake. 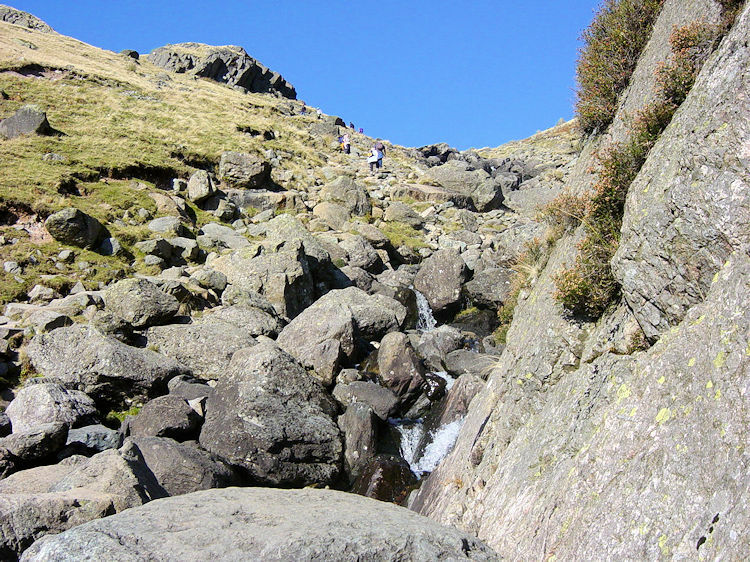 The walk itself takes us from the car park at Rossett just off the B5343 by following Stickle Ghyll upstream to Stickle Tarn. 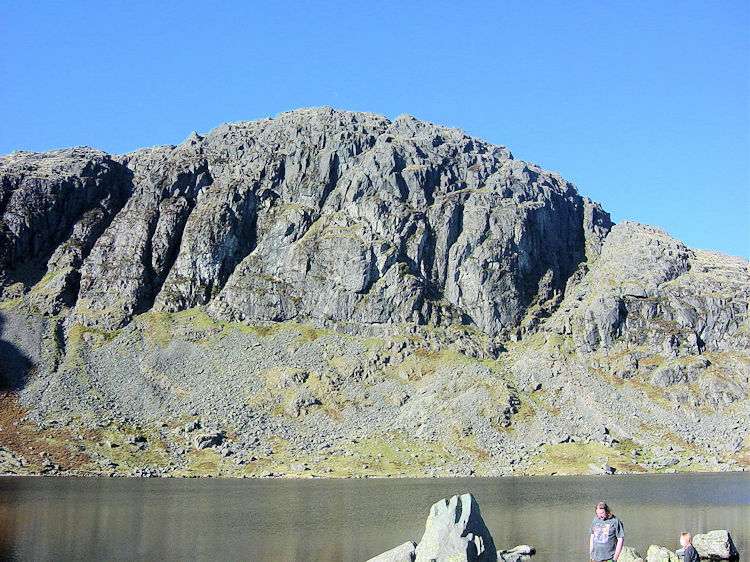 On the other side of the tarn is Pavey Ark so then it's straight up Jack's Rake to height where all the Langdale Pikes are available to explore. We had started late so our walk took us to Thunacar Knott and then down to meet the Cumbria Way path and follow it down Stake Gill to Mickleden and then back to our starting point. 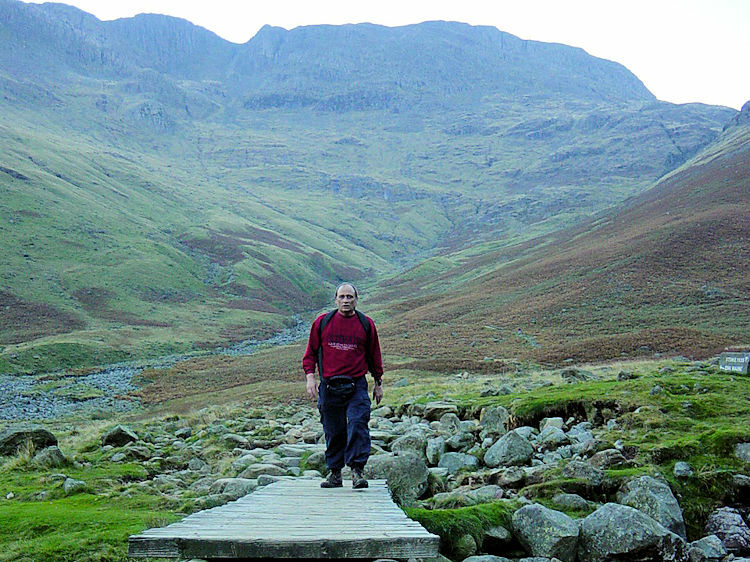 I had never been aware of Jack's Rake until around 2000 when Deke and Spud took Dave, Steve and me on a walk on the Langdale Fells during a Lakes walking weekend. 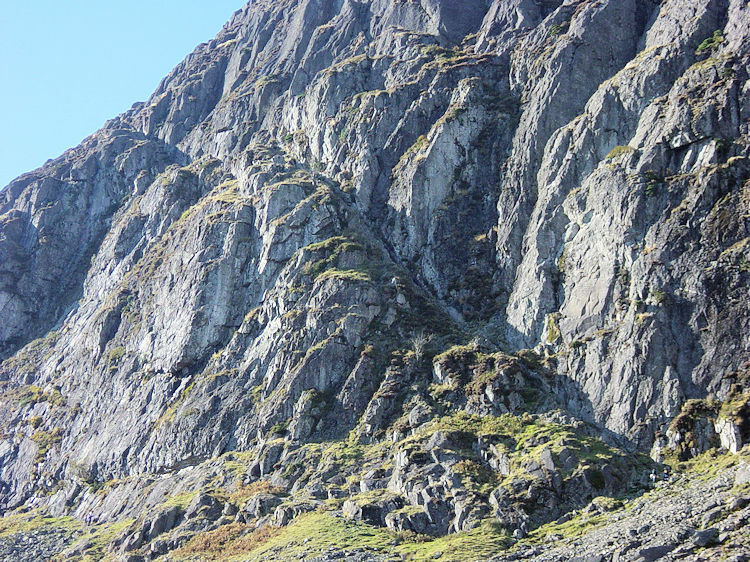 When I had made the stiff climb up Stickle Ghyll and reached the tarn on that occasion I looked at the rake for the first time and was absolutely petrified. There was no way I was going to do it until Deke and Spud reassured me that it was a lot easier than it looked. I remember Deke saying "If I can do it, I am sure you can. Just follow every move I make and you will be ok". I took him on his word and although I was nervous all the way up I did it. 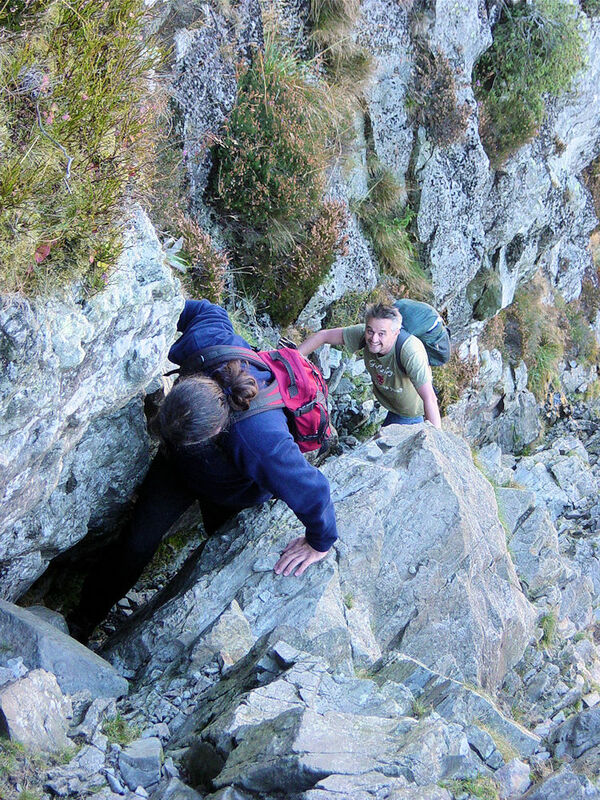 Notably, Dave and Steve declined the invitation and walked round the back of the rake to ascend Pavey Ark by safer ground. However for me it was an exhilarating experience climbing up Jack's Rake for the first time and I still remember those marvellous views from the rake looking towards Windermere. I just knew I had to do it again and this time with camera to capture the moment. And so here I was, again in the great company of Deke and Spud ready with camera and in no fear at all, prepared to meet Jack's Rake again. 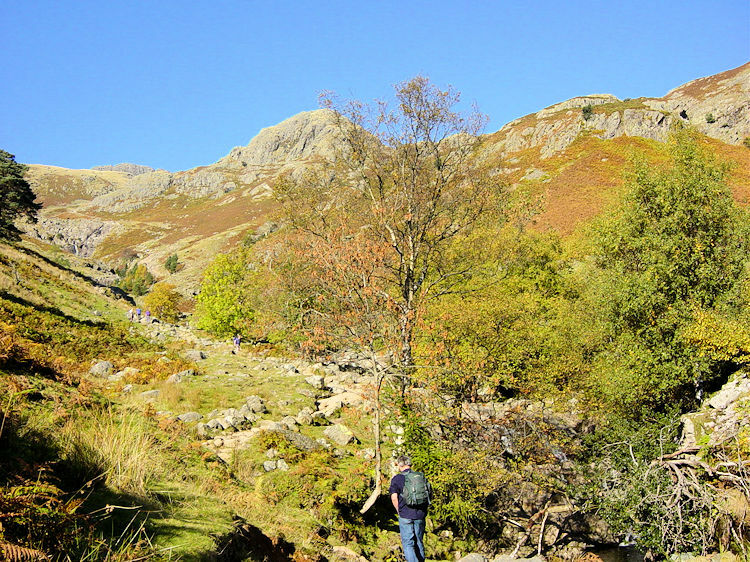 We set off from the car park at Rossett on an unbelievable mid October day. 2003 had been a remarkable year for weather with very little rainfall and today was like mid summer. There was not a cloud in the sky and it was so warm that Spud and I walked in T shirts. Deke kept his fleece on because, as he said "I need to purge". Purge he did because he walked up the lovely Stickle Ghyll, all the 400 metre ascent of it and arrived at Stickle Tarn dripping in perspiration. He was certainly purged now. We stayed at the tarn for a while to soak in the atmosphere. 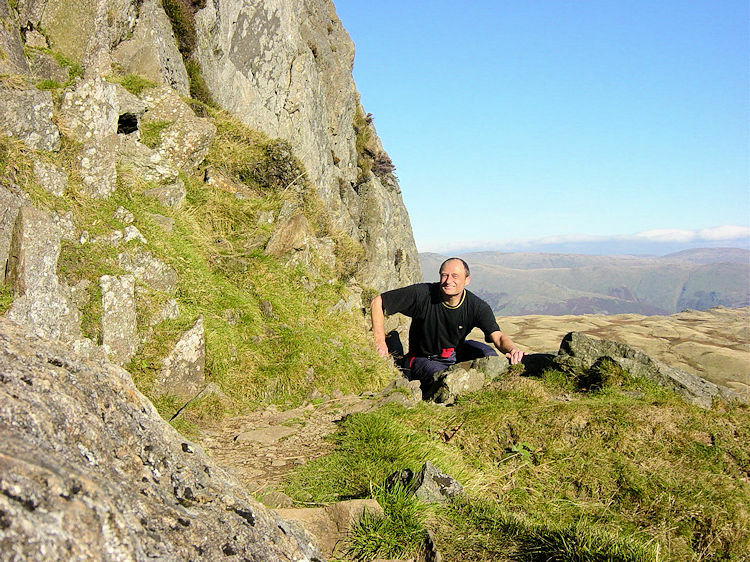 It is a great place to relax and look at what lies ahead because from here the cut of Jack's Rake as it makes its way from top to bottom of Pavey Ark from left to right is clear to see. The exposed areas are also easily in view. "Don't dwell on them". I think to myself. And soon enough I decide to make my way around the tarn to the foot of Jack's Rake with Deke and Spud right behind me. I had decided I was going to lead the way up Jack's Rake this time as I wanted to get photographs of the lads climbing below me and so after a break at the start of the rake I set off up to the first feature point, a sole Rowan tree that has decided to stay in the company of the rake. 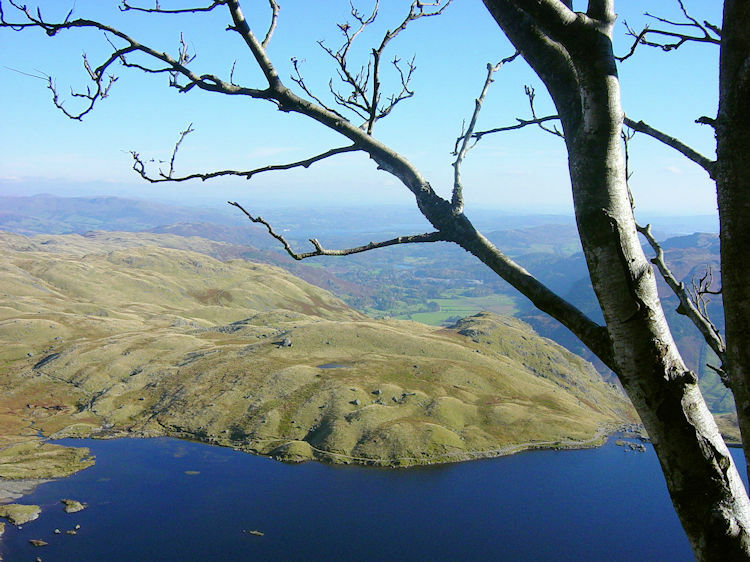 The tree is at a place on Jack's Rake that affords a fantastic view of the Windermere area. At the tree I stopped and took the photographs of the scene immediately below. 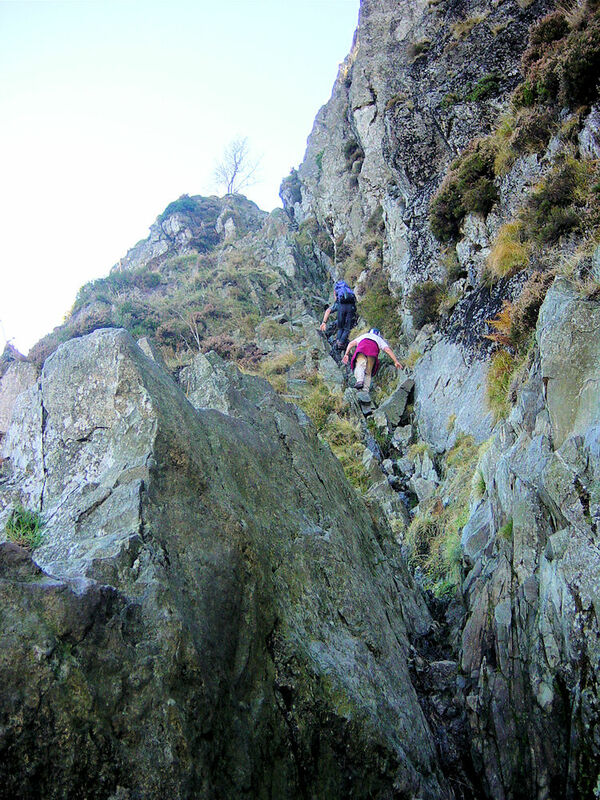 The steepness of the climb and character of Jack's Rake was dramatic. For most of the ascent you are climbing inside a groove and although there are tight spots such as the one Deke is negotiating in one of the pictures the groove provides comforting protection from full exposure. This is a predominant feature but not always the case. 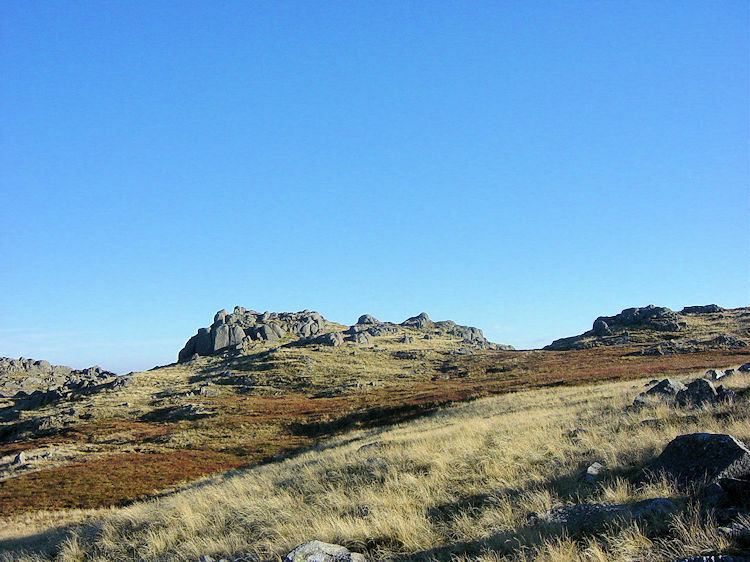 After passing the Rowan tree the climb brings us to a small level area that has no groove at all to protect you. The path here is as wide as a regular street footpath but no more. Step off it to your left and you are gone, falling off Pavey Ark and towards serious trouble so be extremely careful here. On my first ascent three years ago we sat on this exposed ledge to look at the uninhibited views and have a drink. On that occasion my legs quivered but not this time. I was aware of what I was coming to and was ready. This time I paused and took in the view with demons conquered. It was a fantastic moment. After the thrill of life on the edge and then after soaking it all in the boys caught up with me. Deke sat with legs over the edge for a while. I stayed as far back as I could. Then we set off for the summit of Pavey Ark. I let them lead the way to the finale of the climb and our arrival on the top of the mountain. Finishing the scramble was a superb moment and yet I somehow wished it could have gone on. 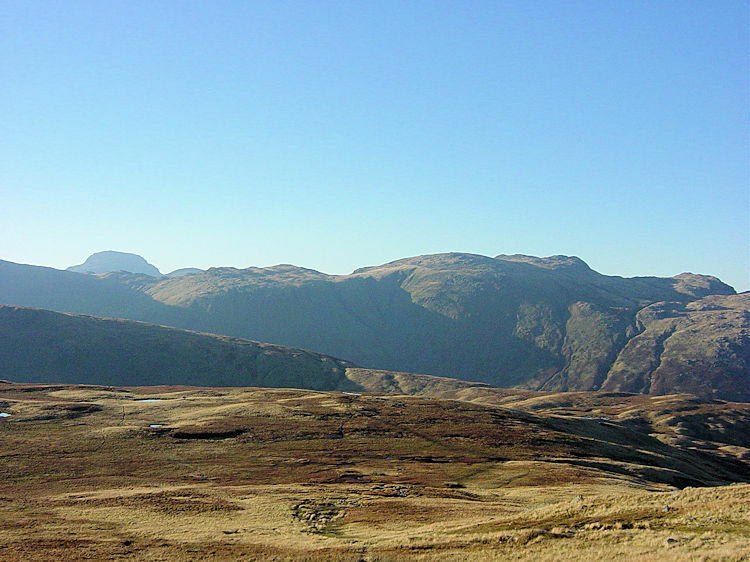 From Pavey Ark it is only a short easy walk to Thunacar Knott which we did before stopping for a short break. After our break on Thunacar Knott we took a leisurely walk over the high ground of Langdale, a walk that pleased Spud as he managed to fall in a bog and dirty his only pair of trousers he had for the weekend which he had to wear in the evenings). 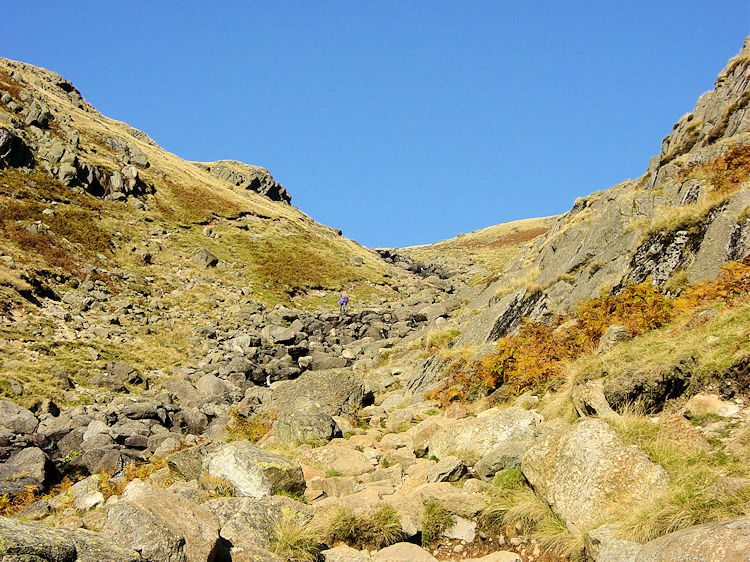 We left the fell by making for the Cumbria Way path and descended Stake Gill into Mickleden. A lovely beck side walk took us back to the road and to the car. A super day was done and Jack's Rake was tamed.